This is an old-time muscadine jelly (or scuppernong) made without pectin. 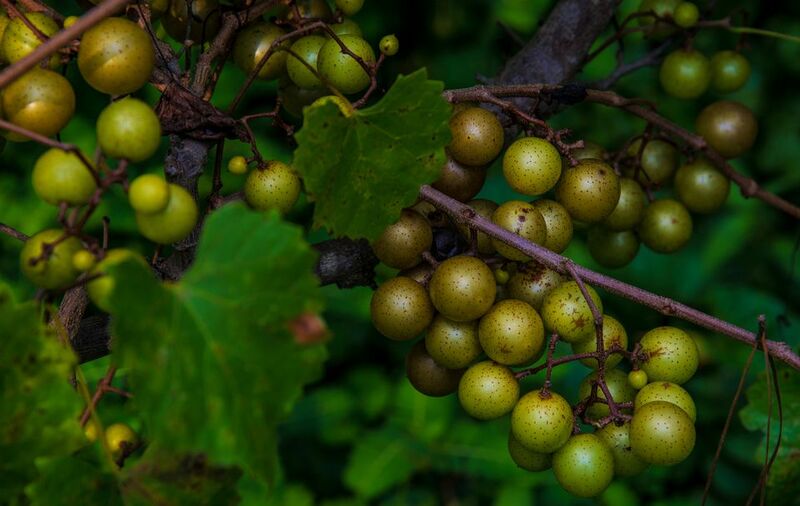 Muscadines and scuppernongs are wild native American grapes found in the Southeastern U.S. The grapes are larger than the grapes you find in your local market. they're about 1 1/2 inches in size. Another difference is the skin. It's rather thick and tough. The flavor is fantastic. The grapes can be enjoyed raw, though you'll probably want to discard all but the delicious juice. Muscadine jam and jelly along with homemade wine are the most popular ways to enjoy the grapes. Stem and wash grapes; mash and place in a pot with water to cover. Simmer for 20 minutes. Press juice out through a colander, then strain through cheesecloth. Take 4 cups of the grape juice (reserve the rest in the refrigerator or freezer for another batch). Pour measured juice back into the pot and heat to boiling. Boil juice for 5 minutes. Meanwhile, heat the sugar in a pan in a 200 F oven. Pour sugar into juice and cook over medium heat until it reaches 220 F on a candy thermometer or about 25 minutes. It should sheet from a cold spoon. Skim off foam. If making scuppernong jelly, you can add a few drops of yellow food coloring to make it more colorful. Pour into hot, sterilized jars and seal (wipe jar mouths with a paper towel moistened with boiled water). Process in boiling water bath for 15 minutes, check seals. Temperature: Attach a candy thermometer to the pan and cook the jam to 220 F, or 8 degrees above the boiling point depending on altitude. For every 1000 feet of altitude above sea level, subtract 2 degrees F.
Freezer Test: Put two or three small plates or saucers in the freezer. Near the end of the cooking time, begin to test. Drop a small dollop of jam on an ice cold plate. Put it back in the freezer for about 2 minutes. If the jam forms a "skin" and wrinkles slightly when gently prodded with your fingertip, the jam is done. If it is still runny and your finger easily makes a trail through it, test again in after few more minutes. Cold Spoon Test: Put several flatware spoons in the refrigerator. Dip a cold spoon into the boiling mixture and lift it over the pan. Let it run off the spoon. When a few drops come together and "sheet" off the spoon, the jam is done.